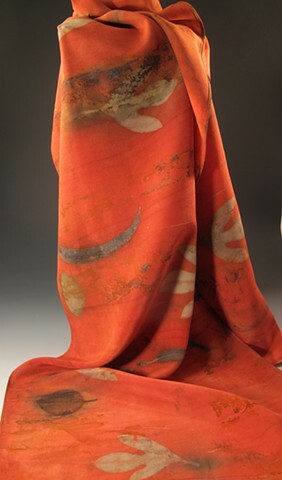 This extra large silk scarf was first rust dyed with various pieces of metal, then created using the "medium print" method of printing plants onto silk with acid dyes. Sassafras and dogwood leaves were collected on Roanoke Island, and the eucalyptus was collected while vacationing near Big Sur, CA. I thought the poppy red color and sassafras leaves were a perfect pairing.